Improper use of the tire jack may cause the vehicle to suddenly fall off the jack, leading to death or serious injury. Do not use the tire jack for any purpose other than replacing tires or installing and removing tire chains. Only use the tire jack that comes with this vehicle for replacing a flat tire. Put the jack properly in its jack point. 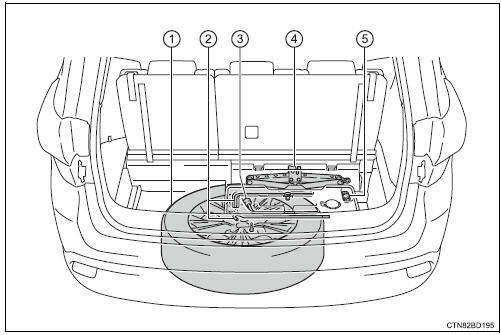 Do not put any part of your body under the vehicle while it is supported by the jack. Do not start the engine or drive the vehicle while the vehicle is supported by the jack. Do not raise the vehicle while someone is inside. Do not raise the vehicle to a height greater than that required to replace the tire. Use a jack stand if it is necessary to get under the vehicle. When lowering the vehicle, make sure that there is no-one near the vehicle. If there are people nearby, warn them vocally before lowering.